The inimitable Yamini Krishnamurthy has been for decades a symbol of the sheer power and radiance of Indian classical dance. The sheer dynamism and charisma of Yamini Krishnamurthy's stage persona ensured her the respect and adulation of people from all walks of life ever since her debut performance in Chennai (former Madras) in 1957. From then on she took her chosen dance styles of Bharata Natyam and Kuchipudi to all corners of India and the world. Admiring audiences recall standing in torrential rain at open-air venues to witness the performances of Yamini Krishnamurthi in her heyday. 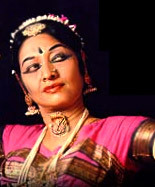 Her initial training in Bharata Natyam took place at Rukmini Devi Arundale's Kalakshetra, at that time India's premier institution for training in this art. After acquiring an impeccable structural base at Kalakshetra, she went on to higher studies under renowned masters such as Kanchipuram Ellappa Pillai, Thanjavur Kittapa Pillai, Dhandayudhapani Pillai and Mylapore Gouri Amma. She also trained in Kuchipudi under illustrious gurus such as Vedantam Lakshmi Narayana Shastri, Chinta Krishnamurthi and Pasumarthy Venugopal Krishna Sharma. This was a period when scholars were looking with renewed interest at the classical arts, and Yamini played a significant role in popularizing Kuchipudi which was then emerging as a solo dance form of Andhra Pradesh in southern India. This eminent dancer Bharatnatyam and Kuchipudi Yamini Krishnamurthy was born into a Telugu family on a full moon night in 1940 at Madanapalli, Andhra Pradesh. Yamini`s father, M. Krishnamurthy, was a Sanskrit scholar and grandfather was an expert in Urdu poetry. Her grandfather named her `Yamini Poornatilaka`, that means "a beautiful mark on the brow of light".At a tender age of five she was enrolled as a student of Bharatnatyam in Kalashetra School of Dance, Chennai under Rukmini Devi Arundale. Yamini Krishnamurthy went to enroll herself to higher studies under renowned masters such as Kanchipuram Ellappa Pillai, Thanjavur Kittapa Pillai, Dhandayudhapani Pillai and Mylapore Gouri Amma after acquiring the foundation from Kalashetra. She has trained under Vedantam Lakshmi Narayana Shastri, Chinta Krishnamurthi and Pasumarthy Venugopal Krishna Sharma in Kuchipudi. In addition to she learnt Odissi from Pankaj Charan Das and Kelucharan Mohapatra. By M.D. Ramanathan she was trained in Carnatic vocal music and learnt the Veena from Kalpakam Swaminathan. Her charisma and stage presence were recognized when she gave her debut in 1957 in Chennai. She became one of the most admired dancers in the country by 1960. Her performances brought about national and international recognition to the classical styles of Bharat Natyam and Kuchipudi. Yamini`s played significant role in popularizing Kuchipudi that was then emerging as a solo dance form of Andhra Pradesh in southern India. Yamini Krishnamurthy has the honor of being `Asthana Nartaki` (resident dancer) of the Tirumala Tirupati Devasthanam, most sacrosanct temples of India and `Sangeet Natak Academy Award` in 1977. Her dancing career brought her many awards, including the Padma Shree in1968 and the Padma Bhushan in 2001, which are among the highest civilian awards of India. This multi faced creative artist made a 13 part serial for Doordarshan on dance. She is the writer of her autobiography "A Passion For Dance", a well received book by the readers. Yamini is working on a ballet, titled `The Gandhian Order of Life` and another on Tagore and Subramania Bharati and their depiction of the Goddess Kali. She had been performing for more than four decades, and led an eventful life. Her life remained dedicated to Dance. Her life revolves around her dance school, her students and her compositions. As she asserts "Marriage did not happen because it was not meant to be. As for children, all my disciples are my children."